That’s right, y’all. 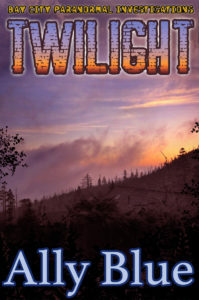 Twilight (Bay City Paranormal Investigations book 3) is now available for pre-order from all the usual vendors. Release date will be Saturday Jan. 6th, 2018. Hopefully I’ll remember to update my own website on release day this time! In the twilight shadows, nothing is what it seems. And not all the monsters have claws. While leading an amateur ghost-hunting expedition in Asheville, NC, Bay City Paranormal is called to investigate Sunset Lodge, a rustic inn situated on a remote Smoky Mountain peak. In recent weeks, employees and guests alike have seen a weird, frightening creature in the forest near the Lodge. A creature which sounds all too familiar to the BCPI team. Sam Raintree doesn’t want to deal with another interdimensional gateway. The last one they faced nearly took the life of Sam’s employer and lover, Dr. Bo Broussard. Sam can’t stand the thought of it happening again. Especially now that he and Bo are finally together and working through their problems. But Sam’s psychokinetic abilities give him the power to permanently close the gateways, and he can’t bring himself to ignore that. With the safety of the Sunset Lodge staff and guests at stake, Sam, Bo and their colleague, Dean Delapore, make the trip to the Lodge to determine if it indeed hosts a portal to another dimension. At the beautiful and remote Sunset Lodge, a missing man, a grisly discovery, and a moment of carelessness converge to reveal secrets much different – and far uglier – than any the BCPI team expected. Secrets which not only put their lives in danger, but which might provide Sam with an escape from the portals. If he’s willing to take it. This entry was posted on November 15, 2017, in Uncategorized. Okay, I’m the worst. 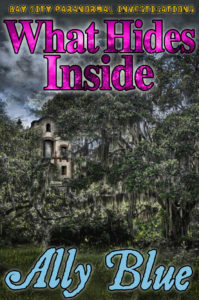 I COMPLETELY forgot to post on my website when What Hides Inside (Bay City Paranormal Investigations book 2) became available for download. Doh. Anyway, it’s here, ready to read. Hope y’all enjoy! Facing an alternate-reality horror: potentially deadly. Facing their own secrets and lies? Much worse.